When the playoffs roll around, fans hope to see the best of the best rise to the top. They hope to see their favorite players do what they do best. If things go well, a new star will rise, and an unknown player will make a significant contribution. But whatever happens, will mean nothing if the score isn’t in their favor in the end. Friday night saw some superstars rise to the top and lead their team to victory. Others were just another piece of the machine. Regardless of who did what, by the end of the night fans of the Celtics, Thunder, and Clippers were able to go home smiling. The surprise of the postseason so far has been the 8-seeded Chicago Bulls dominating the 1-seeded Boston Celtics. Stealing a win in Game One was one thing, but to do it again in Game Two–that meant the Celtics were officially in trouble. To salvage some pride and a chance at winning the series the Celtics had to win Friday night—a task that was made a little easier after some news broke Friday afternoon. It appears that Bulls guard Rajon Rondo had fractured his thumb during Game Two and would be out indefinitely. Chicago’s loss was Boston’s gain—but could the Celtics take advantage of it? As it turns out—yes, yes they could. His absence was felt by the Bulls, and it showed in how the first quarter played out as the Celtics jumped out to a 33-15 lead—but Chicago wasn’t going to go down without a fight. After Boston had extended their lead to 20 points, 37-17, the Bulls offense appeared to wake up. They were unable to erase the whole deficit, but they made the score respectable heading into halftime, 44-41. But it wouldn’t stay close for long. Boston extended the lead to 13 by the end of the third period and did enough in the fourth to make sure Chicago never came close. Without Rondo, the Bulls simply didn’t move the ball around as much as they had the previous two games. But he still “tried” to have an impact on the game. 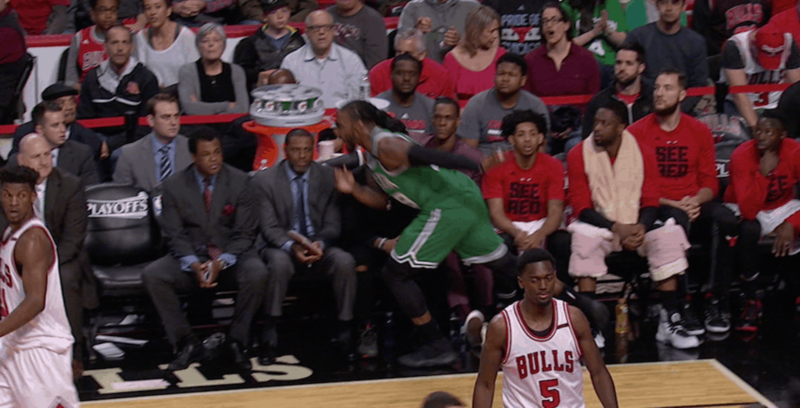 At one point, it appeared as if he might have tried to trip Jae Crowder. He says he was just stretching (insert snicker here). Boston didn’t have any with a standout performance but did get solid performances by most of their starters. Al Horford led the way with 18 points followed by Jae Crowder and Isaiah Thomas with 16, and Avery Bradley chipped in 15. Boston needed something to help them get into the series, and it appears they may have gotten it with Rondo’s injury. Game Four will be Sunday at 6:30 PM ET on TNT. 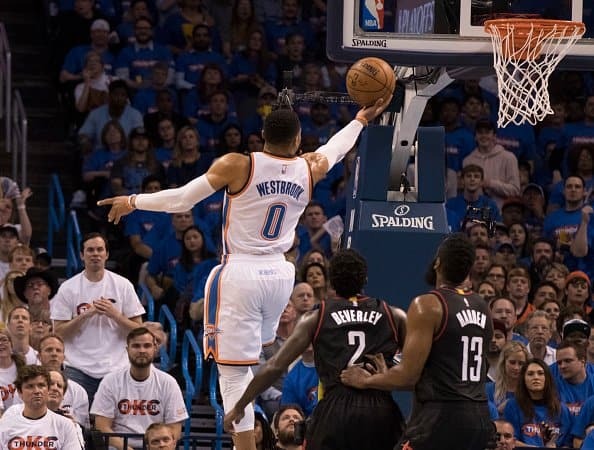 Houston-Oklahoma City was the most anticipated matchup heading into the playoffs as fans envisioned the excitement James Harden and Russell Westbrook could generate. So far, they have not disappointed, and they certainly didn’t Friday night. Westbrook led the way for the Thunder (shocker) with another triple-double (32 points, 13 rebounds, and 11 assists) but this time it was in a winning effort—but it almost wasn’t. After getting out to a double-digit lead after three-quarters, the Thunder saw the Rockets slowly chip away at the lead until it disappeared. With 52 seconds left in the game, James Harden hit a 25-foot three-pointer to make the score 111-111. But Houston wouldn’t make another shot from the floor. Harden hit a pair of free throws to bring Houston within a point with 8 seconds left, 114-113. Russell Westbrook would hit one more free throw to make the final score 115-113—but the drama wasn’t done yet. James Harden got a chance to hit what would have been a game-winning three-pointer as time expired—but missed. Harden led the Rockets with 44 points, six assists, and six rebounds. Lou Williams chipped in 22 off the bench. But they will need to figure out how to avoid another slow start if they want to win Game Four (Sunday at 3:30 PM ET on ABC). 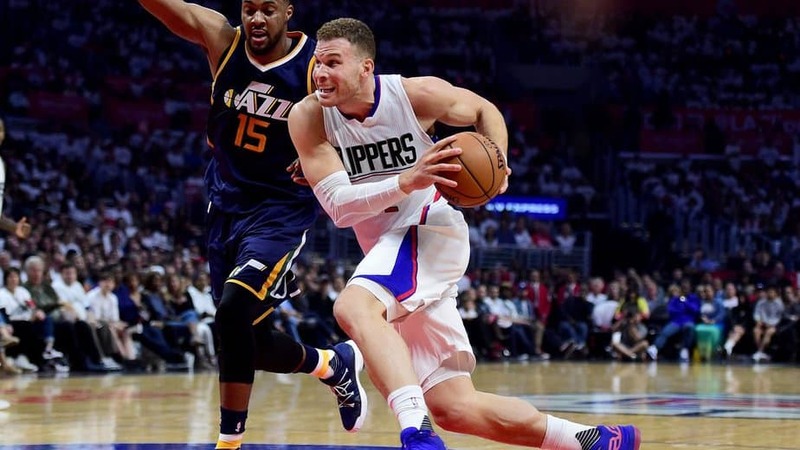 The Los Angeles Clippers were not in a must-win situation heading into Game Three against the Jazz. But they turned Game Four into one for the Jazz by stealing a win in Salt Lake City. However, the win came at a cost. Blake Griffin was forced to leave the game in the first half with a toe injury and did not return. As luck would have it, he will miss the rest of the postseason because of the injury to the plantar plate of his right big toe. But the good thing about having multiple stars on your roster is that when one goes down the team isn’t dead in the water. An opportunity has been created for one of the other stars to rise above—like Chris Paul ended up doing. “I’m just always looking at the scoreboard trying to manage the game,” Paul said after the game. “I was just trying to pick my spots. That’s a good team over there. They stick to their principles. Paul led the come-from-behind charge for the Clippers with a season-high 34 points (along with ten assists and seven rebounds). It took the Clippers a couple of quarters to overcome the lead. But heading into the final period the Clippers were only down by two, 84-82. The game remained close the rest of the way with neither team able to gain an advantage until the final seconds of the game. A pair of free throws by JJ Reddick gave the Clippers a 106-102 lead with nine seconds left. But then George Hill hit a three-pointer to pull the Jazz back within one with seven seconds on the clock. Los Angeles didn’t ice the game until Chris Paul hit a pair of free throws with a second on the clock to make the final 111-106. Gordon Hayward led the Jazz with a career-high 40-points. But beyond George Hill’s 26 points, he didn’t get much help from his team. Game Four will be Sunday night at 9 PM ET on TNT.